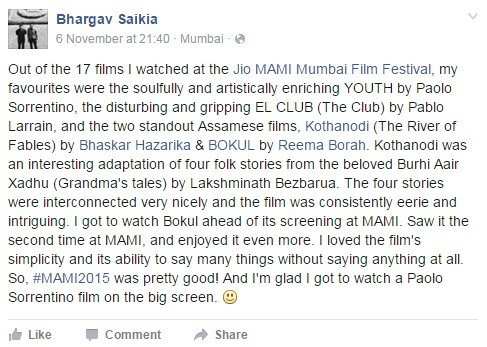 Directed by Reema Bora Assamese Film Bokul has been selected in the ‘India Story’ section, at MAMI, Mumbai film festival. 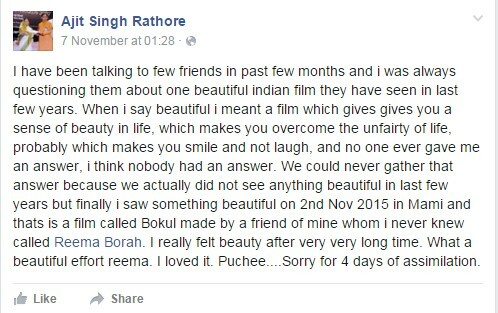 The film Bokul, is about a man, Raktim, who comes back to his homeland on the Brahmaputra valley, after a break of several years. He has a hard time to recognize the changed values and generations of his hometown. Even the people he used to know seem to have changed. As Raktim tours across the city on his scooter, he picks up the tales of three distinct characters, a young rickshaw puller, a late-youth woman with a daughter and an old fisherman- all sharing the name Bokul. As an outsider, who was insider years back, changing realities, displacement of people and values, and beads of tales leading to a pattern, expose themselves to Raktim through the three characters. and contd… If you have any views on this film then please use the comment box bellow. Bokul is a very important film in todays indie film scenario in India. People normally understand low budget by the word independent. But, actually independent can almost be replaced by the word personal, authorial. This film showed us that finally filmmaking is about love and dreaming.